Cod pieces lightly breaded in panko then baked for a crispy bite. 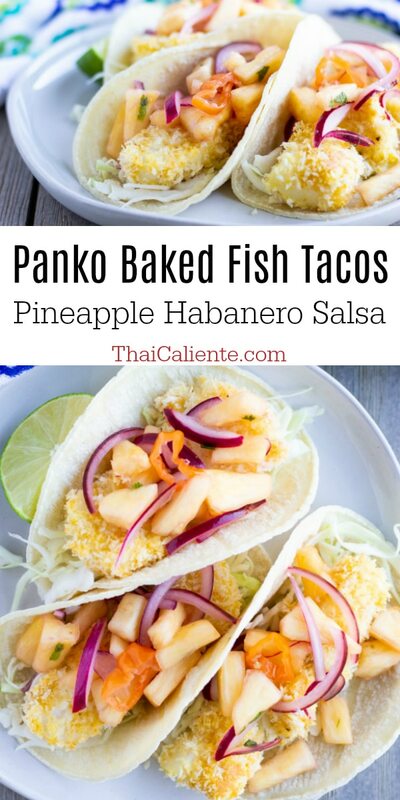 Load them on a tortilla with cabbage and a spicy pineapple habanero salsa for a fish taco that’s healthy and loaded with flavor! I know it’s already officially Fall, but I’m holding on to the last fresh ingredients of Summer till the very end. Fresh pineapple was on sale at the grocery store and while it wasn’t super sweet, it was still pretty good for this time of year. I normally use jalapenos when I’m making any type of salsa, but my mother in law made a pineapple habanero salsa that was good and spicy. This salsa is not for the weak and if you need to tone down the spice then just use jalapenos instead. I’ve mentioned it before, I’m not a fan of frying, mainly because I don’t like cleaning up the mess, and it’s not very healthy either. I did an egg and panko dip for the cod pieces and baked them in the oven. The fish turned out nice and crispy without being dry. For the salsa, if you don’t have fresh pineapple, you could used canned, just be sure to drain it. Fresh mango would also work well too! I also added sliced red onions because I just love how they give the salsa a pretty color. 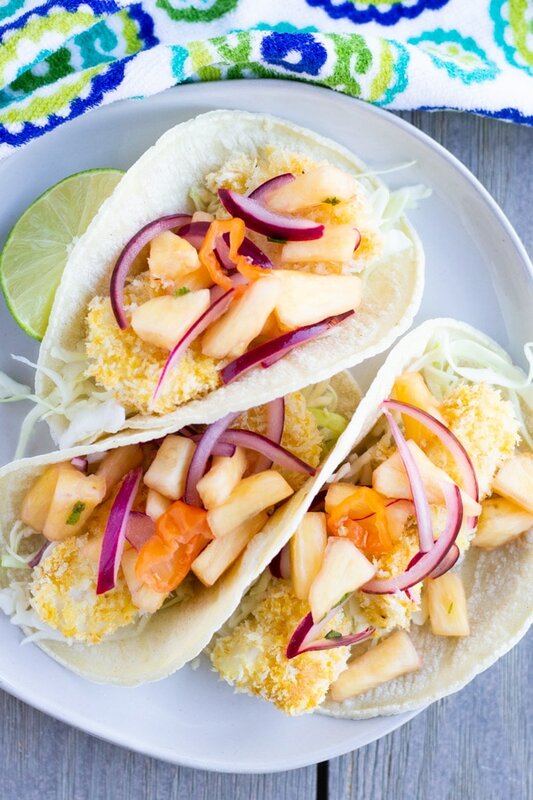 Assemble your tacos with corn or flour tortillas, some shredded cabbage, I always buy the bagged kind, then top with the fish and pineapple salsa. These tacos are pretty filling on their own, but you could always serve them with some Mexican Rice or beans. 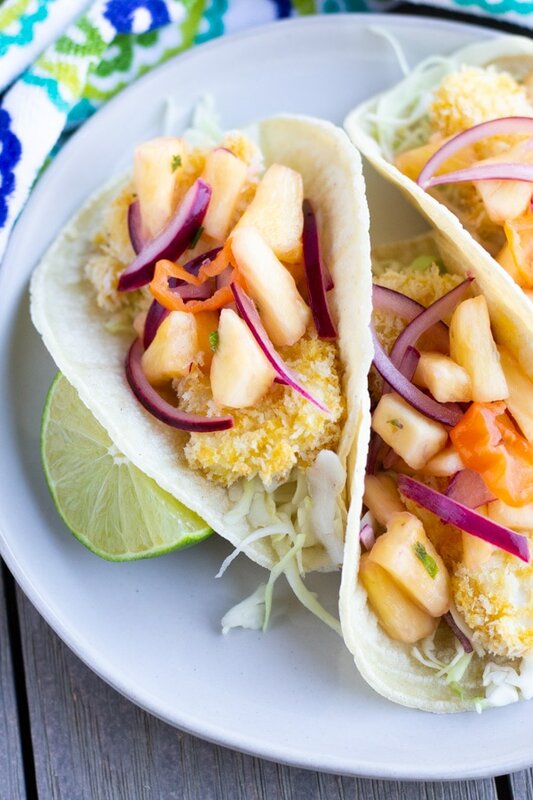 Panko crusted baked fish paired with a spicy pineapple habanero salsa makes for a fresh and healthy fish taco that's full of flavor. Pre-heat oven to 350 degrees. Spray a large baking sheet with cooking oil spray. In a skillet over medium heat, add panko with salt and pepper and lightly toast. Keep moving the panko in the pan so it doesn't burn. Once it turns light brown, remove and place in a small plate. Cut fish into even chunks and season with salt and pepper. Set up a breading station with 1 egg scrambled in a bowl, panko close by, and your greased baking sheet. Dip fish into egg, then roll in panko and set on baking sheet. Once all the fish has been breaded, lightly spray the top with cooking oil spray and bake for 10 minutes or until fish is no longer opaque. Turn oven off and place your tortillas in the oven to warm them up. 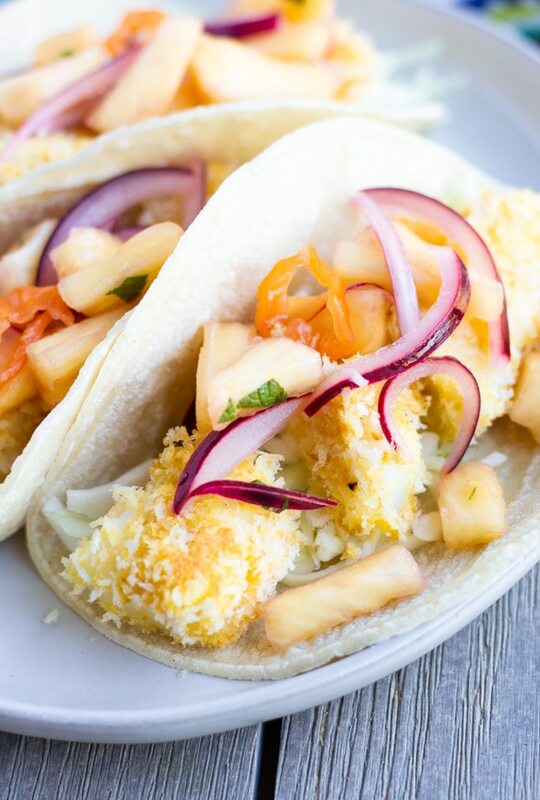 Remove and assemble tacos with Shredded cabbage on bottom, a squeeze of lime, the panko fish, and top with the pineapple salsa. Love this! specially your recipe for habanero sauce. This look yummy! !